Up and down, up and down the stairs again and again with boxes of ceiling tiles, cans of paint, tools, a shop vac, more tools, long strips of molding, and more. The man who remodeled my upstairs bedroom got his exercise . . . I, on the other hand, held the front door open. It took less than thirty hours for my helper to work his magic. Every day he decreased the old and increased the new. 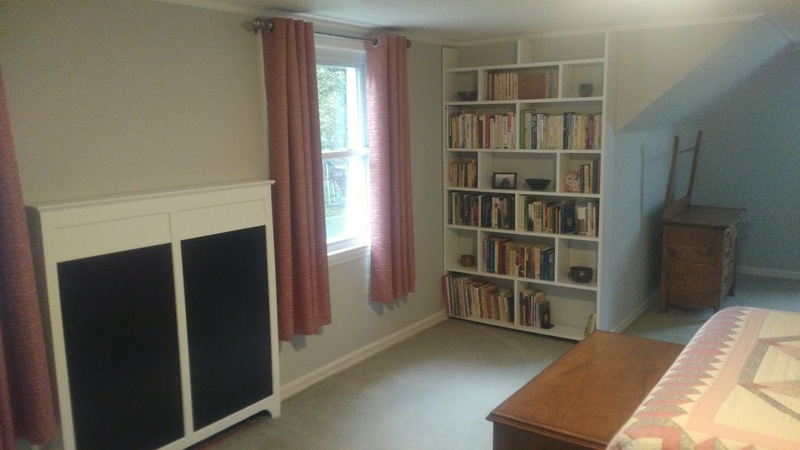 From the tidy ceiling to the freshly painted woodwork to the crisp updated look of the walls to the transformed radiator cover to the curtain rods, he changed my early 1990s bedroom into a modern inviting retreat. I took photos every evening to send to my daughters. After the contractor left, I just sat on the bed for a while, enjoying my new nighttime surroundings and thanking God for providing another of His good gifts. I couldn't help but think of the verse in Ecclesiastes 3:11: "He has made everything beautiful in its time." Well, as "beautiful" as possible for a 1940s house with few, if any, square corners! As I've been slowly moving my belongings back into closets and drawers, it's dawning on me that 25 years ago my husband and I felt the same satisfaction after doing this room over the first time. Back then the shabby wallpaper was bright, the chipped woodwork uniform, the carpet new, and the faded quilt vivid with color. We never thought all of our hard work would someday look dated and dingy. But new has a habit of aging . . . whether it's a room, a home, a car . . . a life. Kinda puts it all in perspective, doesn't it? We try to maintain what God has given us, and at the same time, how essential to evaluate how we're investing our time and talents. "For what is seen is temporary, but what is unseen is eternal" (2 Corinthians 4:18). I still need to put some finishing touches on my room . . . shampoo the carpet, hang a few pictures, organize the closets. I plan to enjoy the newness and also use my remodel job as a reminder of Jesus' words: "Let not your hearts be troubled. . . . In my Father's house are many rooms. . . . I go to prepare a place for you (John 14:1, 2). Someday, we will enjoy our new heavenly home, grander than any earthbound remodeling job could ever be!